So I recently joined a freezer meal group in my neighborhood- once a month we will be getting together and each person prepares 5 meals of the same freezer meal. We then swap meals, sending each lady home with 5 different meals, ready to eat in a matter of minutes! Brilliant! Preheat the oven to 350 degrees F (175 degrees C). Spray 2 8×8 inch pans with non-stick cooking spray. Layer as follows in each pan: 1/4 of the ziti, 1/4 of the sauce, 4 slices of Provolone cheese, 1/2 of sour cream, 1/4 of ziti, 1/4 mozzarella cheese and 1/4 of sauce mixture. Top with grated Parmesan cheese and remaining mozzarella cheese. You can eat one for dinner now and freeze the other for dinner another day! To freeze this meal: Follow the instructions above, except for the last step of cooking it. 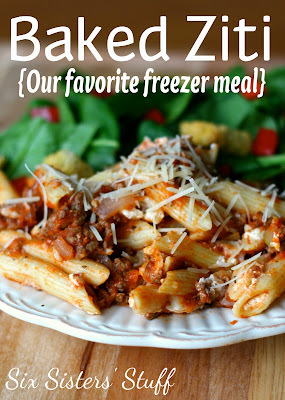 Cover the assembled ziti with foil and stick in the freezer (I usually use 2-3 layers of foil just to keep out the freezer burn). It will last in the freezer for about 30 days. When you are ready to eat it, remove from the freezer and place in the fridge to thaw 24 hours in advance. By allowing it to thaw in the fridge, you can cook it at the regular time and temperature (350 degrees for about 30 minutes). If you do not thaw it in advance, it will take much longer to cook. If you cook it completely frozen, it will take anywhere from 90 minutes – 2 hours to cook all the way through. These fill the 8×8″ pans to the top, so I cooked mine on a large cookie sheet just in case they bubbled over (which they did!). This was definitely a keeper . . . my whole family devoured it (even the kids!)!! **If you are preparing this for a large group, you can use a DEEP 9×13″ pan, but be aware that it will fill it all the way to the top!